Generally I’m ALL FOR cooking with lovely fresh produce in creative and interesting ways that promote vibrant good health, happy bowels and an I-never-eat-processed-food glow. At other times, say later in the term (mainly on a Thursday night) when all I’m really looking for is wine and a bit of silence, I’m happy to bend my rules to create a healthy dinner with the minimal amount of effort. So here it is, my dirty-little-secret dinner that is perfect for those nights, later in the term when everyone has their grumpy heads on. All the ingredients can be stored long-term in the pantry or fridge (most of you can crisper-dive to find a squishy carrot & soggy spring onions, I’m sure). 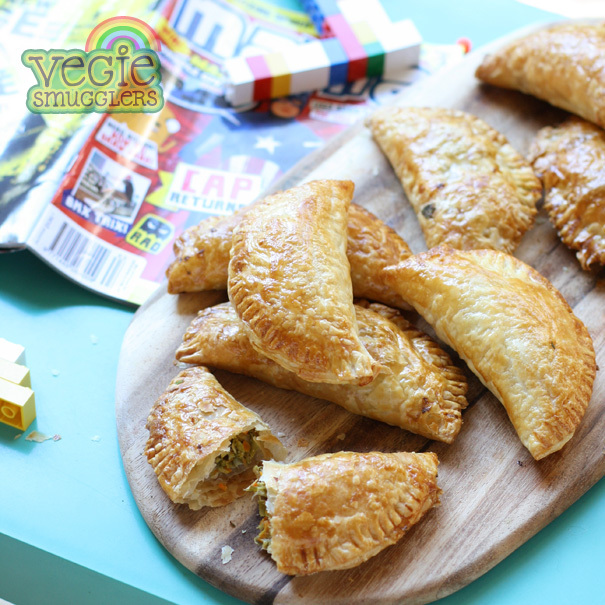 All you do is mix it up and bake, then serve to kids who adore this easy-to-eat, comfort-food dinner. So easy and a total hit with the kids. Preheat the oven to 180C. Grease a pie dish with spray oil. In a large bowl, combine everything, except 1/4 cup of the cheese. Season. Add in parsley or chives if you’re feeling fancy. Tip into the oven dish, spread it evenly and sprinkle the rest of the cheese on top. Like this recipe? 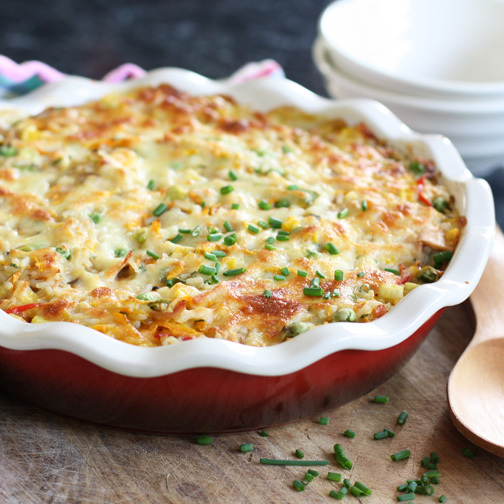 Check out my digital cookbooks to find a bunch more meals that your family will love. Can’t cook? Or too tired to cook? Try this. Now where is this year going? And how did this term slip by so quickly! I don’t know about you, but for us this last week or two of term is a bit fraught. Possibly the cupboards are empty, the kids are tired and motivation is low. But there’s no need to hang up the healthy food towel. Before you dial a takeaway, make the most of your pantry stash. This shakshouska, is way cool and is more compiling than cooking. Served with a bit of bread, it keeps everyone in my house pretty happy. A nice alternative to toasties or baked beans – and just as easy. 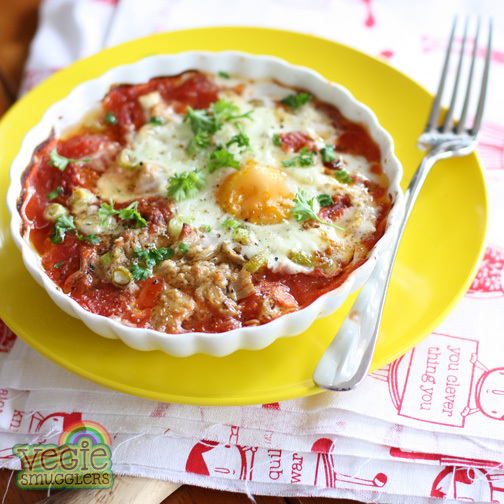 Younger kids might like a version of this with just a few spoonfuls of tomato, an egg and scattered ham. To serve: parsley (from the garden), salt, pepper, sourdough (for dipping). Place your individual dishes or ramekins on a baking tray (to make handling easier). Divide the ingredients between your dishes, in quantities that will suit each diner. Finally, scoop a bit of a dent in the mix and quickly crack in an egg. Bake for 15-25 minutes until the eggs are cooked to your liking. I’ve managed to convince my kids that I have x-ray vision. My superpower was revealed last weekend during a session of “guess what colour undies I’m wearing”. To the utter astonishment of my children I was able to correctly guess what colour undies they were both wearing AND my own AND daddy’s, too. “How’d you do that? !” they wanted to know. Nodding, they looked at me in awe, oblivious to the fact that as chief buyer, washerer and folderer of all the smalls at VSHQ I had a distinct advantage in the game and I’d simply just guessed the most common colour from their clothes pile. It was luck that I was right every single time. But my status as the ‘undie-whisperer’ was cemented, and I’m now known for my mysterious super-powers – a fact which I’ll be sure to remind them off during their teenage years when they think I can’t see that packet of ciggies stashed in the bottom of their school bag. Test out your superpowers by telling your kids to eat these mini salmon cakes, then you’ll practice your x-ray powers by looking into their tummies to count the number in there. And I can see what vegies are in here, too, but the kids can’t. Preheat the oven to 190C. Line an oven tray with baking paper. Cook your potatoes. It’s up to you whether you bake them, steam them or be terribly unfashionable like me and just microwave them until the insides are a mashing consistency. Cook your cauliflower. Same as above. You want it 90% cooked, still firm enough to dice finely, so that it will disappear into the potato. Add your cooked potatoes to a large mixing bowl. Mash with a fork and mix in the cauliflower and all of the other ingredients (except the breadcrumbs). Season and combine really well. Roll bite-sized balls of mixture, coat in breadcrumbs and place on your tray. Spray with oil spray and bake for 20 minutes. Carefully turn the balls over, spray with extra oil and cook for a further 10 minutes until golden. Serve as is or with a dollop of mayonaise and salad. Serves 2 adults & 2 small kids, along with salad. It would appear that my eyesight is on the way out. I’d been warned that it would happen after I turned 40, but pompously I dismissed such negative jibber jabber until the other day when I read a crossword clue out loud to my family. “What’s a Mexican shack, four letters, T then A then something then O”? Personally, I think they and their condescending ways can an all go to hell and buggered if I’m ever going to risk the ribbing of serving them tacos ever again. Which is a shame, considering how delicious these fish ones are. 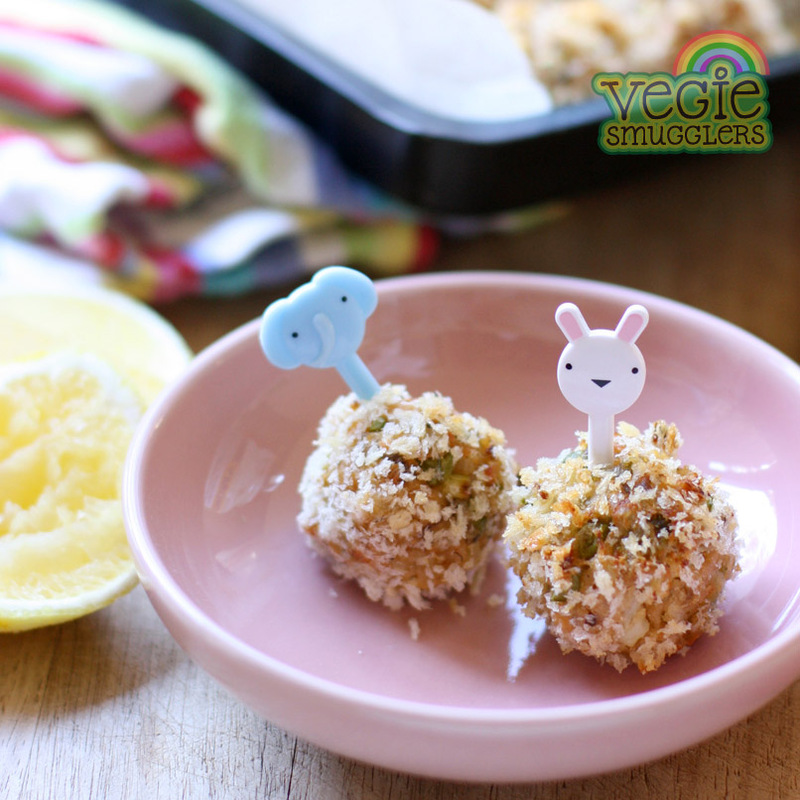 They’re easy too – the only hassle being crumbing the nugget-sized bits of fish. But hey, that’s why we have children and their nimble fingers. Line them up at the counter – each in charge of part of the process and you’ll be done in no time. Just make sure you cook these on the night before you plan to mop the floor. This is a perfect meal to serve friends and family – you can make the coleslaw a few hours ahead, and the fish can be crumbed and stored in the fridge until you’re ready to cook. 1/4 cup each coriander & parsley (add these after you’ve served the kids if green flecks will cause too much grief). Preheat the oven to 200C. Line a baking tray with baking paper and spray with oil spray. Grab three bowls. Pop the flour into one, whisk the egg into another and mix the panko, herbs and spices in the third. Drop the fish into the flour. Shake off any excess and dip into the egg (coat thoroughly), then drop into the breadcrumb mixture and press on a nice even coating. Place onto your oven tray. Spray with oil spray. Bake for 15-20 minutes until golden and cooked through. Mix the vegies in a salad bowl. Whisk together the yoghurt, juice and oil and pour over. Toss the herbs in now or leave them on the side for adults to mix in once the kids have been served. Mash the avocado in a bowl and mix in the other ingredients. Prepare the tortillas according to packet directions. 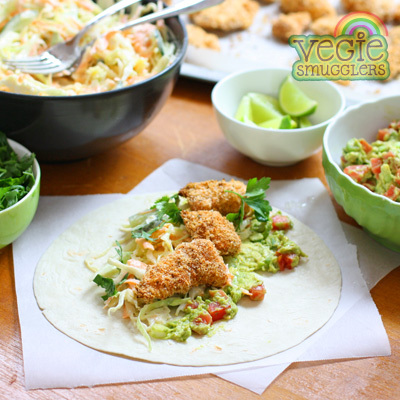 Smear over some guacamole; add some coleslaw and fish pieces. Adults might like some jalapenos. Enjoy! We love a bit of Japanese food here at VSHQ, whether it’s the okonomiyaki or the sushi slice or a variation on a noodle soup. 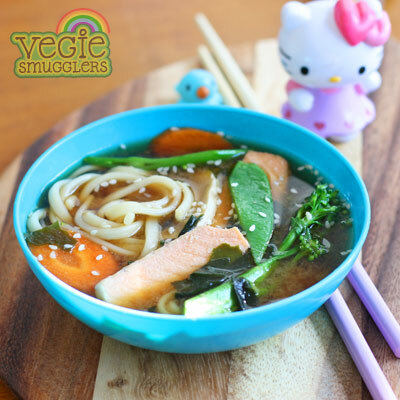 For this basic broth recipe, I’ve chosen to include udon noodles since they’re so damn FUN, but soba is also delicious. And just because I recommend tofu or salmon, don’t think for a second that you need listen to me – it would also be great with super thin slices of rump or shredded BBQ chicken. We’ve made it with the pork wontons and they went so well with these flavours that I’m expecting an invitation to the wedding any day now. And that’s it for this week – I’m keeping it short & sweet, I’ve got a lot on my mind – one of which is the new VS cookbook which has just hit the shop. Check it out here! Use the basic broth and add whatever suits your family. 4 medium-sized mushrooms, sliced (again, if your family won’t eat them, leave the pieces large enough to flavour the soup but fish them out before serving). And add your choice of vegies… green beans, snow peas, sugar snap peas, carrots, spring onions, brocollini. Optional extras…. top it off with dried wakame and/or sesame seeds. Combine all the soup ingredients in a medium saucepan. Bring to a simmer. Cook for about 10 minutes. If you have time, turn off the heat and leave it all to sit for an hour or so to infuse. When you’re ready to eat, bring the soup back to boiling, remove the garlic and star anise chunks (and mushrooms if your kids won’t tolerate it). Add in the thicker vegies and the tofu/salmon for a couple of minutes, before adding in the quick cook items like snow peas. Serve over the noodles and top with wakame and sesame seeds. Eat it with chopsticks and a big, slurpy Asian spoon. Miss F and Mr M&P were outside on the weekend, setting the ground rules for an imaginative play game. Being a Virgo, Miss F likes to have the back-story fully told, with characters thoroughly fleshed out before the playing begins. Usually she will transform herself and her brother into animals, so the species, colour, familial relationships, full names, colour preferences and purpose of journey/adventure will all be established before she get into character (and the dirt) ready to play. Mr M&P is a less complicated fellow but happily goes along with it all. He was nodding away, agreeing to all the details and finally added his own, “and all their last names will be ‘Doodle’”. Smirk smirk snigger. “Why?” demanded Miss F, more than a bit annoyed by his flippancy. “Just because” said Mr M&P with such a sense of finality that I was impressed. I loved evesdropping on perfect a moment of childhood. Just because. There is no reason. Just because doodle is a funny word and it makes him (and me) laugh. I realised that I don’t do much ‘just because’. There doesn’t seem to be much room for ‘just because’ when you’re an adult. Everything seems to need a reason, a justification for why I’m spending energy on it. Things can be fun, but they are usually with purpose. Perhaps this is why I love summer so much. There’s a whole lot more opportunity for ‘just because’. Sure you have a swim for the valid reason that you need to cool down, but while you’re under water it’s nice to have a glide about and pretend you’re a mermaid (if only for a few seconds). Just because it’s good for your soul to have a bit of silly fun from time to time. And I’m thinking that the pursuit of ‘just because’ might be one of my new goals for 2013. Before that though, we’ve got the Christmas season to get through. 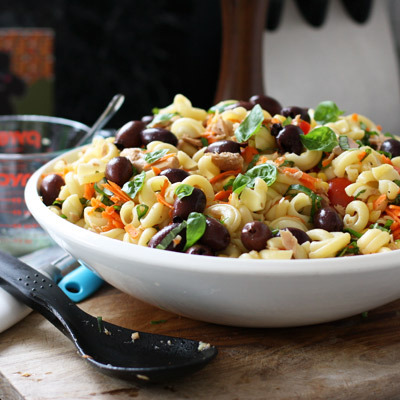 The barrage of upcoming events is likely to cause havoc to your usual routines, which is why I’m proposing a pasta salad this week. Make a batch of it and you’ll have instant dinners and lunches ready to go whenever you need them. Should give you more ‘just because’ time. Combine all of these ingredients and mix well. Keeps for a couple of weeks in the fridge. 400g can tuna in spring water (drained) – Omit this ingredient for a vegetarian salad! Cook the pasta according to packet directions. Drain quickly and return to the hot pan. Pour over the salad dressing and toss through the tomatoes and spring onions (the residual heat of the pasta cooks them slightly). Mix through the rest of the ingredients. Season well with pepper. Serve warm or pop straight into the fridge and enjoy later on, cold. Serves a family of four for dinner, then enough for lunches the next day too.